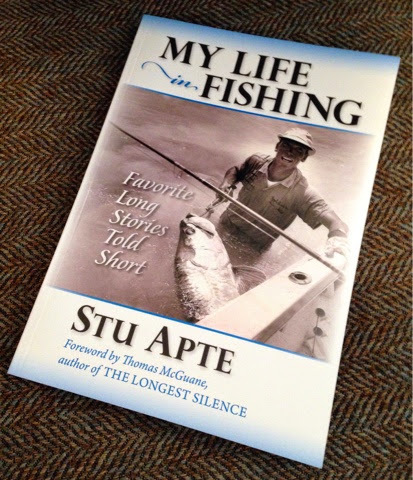 Stonefly Press just released a new book by Stu Apte called My Life in Fishing. I just received a copy, and I'm looking forward to reading it fully this Christmas season. I've already read a couple of stories, and could hardly put the book down. I'm a big fan of history, and really enjoyed a story about Apte guiding President Harry Truman and his wife while fishing for bonefish. If you are looking for a stocking stuffer for the fisherman in your life, this would make a great gift. In My Life in Fishing, as only the most accomplished captain and guide can, Stu Apte shares his tips and insights gleaned from his lifelong pursuit for any and every species. These are his favorite personal stories, about world records, and winds, and tides, and patterns, and flies, but also about the remarkable people who have fished their way through his life. There are stories and glimpses that you won’t find in other history books – an amusing episode with Harry and Bess Truman on board Stu’s skiff, an impromptu side-of-the-road meeting with baseball hall-of-famer Ted Williams that led to a forty-year friendship, and an afternoon of drinking Cuban mojitos aboard Pilar with Earnest Hemingway that includes Hemingway’s own mojito recipe. My Life in Fishing is more than a collection of engaging stories and fly fishing pointers; it is a glimpse of the development and evolution of the sport, and of saltwater fly fishing at its highest level, through the eyes and anecdotes of the only man who can tell the stories. Check out this book, along with other great books (including one of my past favorites, 50 Best Tailwaters to Fly Fish), at stoneflypress.com. Hey Mike, I just got a copy as well and I'm really looking forward to Christmas week off and sitting back and relaxing with it. Merry Christmas and Happy New Year to one of my favorite people! Merry Christmas to you as well! Enjoy some time off with a great book. Thanks for following the blog as well, I appreciate your comments.